You may have noticed us making quite a fuss over the years about the fantastically good Pinot Noirs from Bodegas Chacra in Patagonia. But, planted alongside the 1955 vineyard is a block of Merlot vines and we haven’t made nearly enough noise about them. Here is the noise. Some 620 miles south of Buenos Aires (and even further south from the Argentine wine lands of Mendoza), halfway between the Andes and the Atlantic sits Bodegas Chacra. Although irrigated by waters from the Andes, brought by channels dug by British engineers in the 1820’s, this is an arid cool land, surrounded by desert. The desert acts as a barrier to disease, the dry air impedes the development of disease and rot and allows for a very natural viticultual regime. The altitude (750ft) and cool southern location, and absence of disease, means that Pinot Noir grows well here, something that Piero Incisa della Rocchetta found when he stumbled across a couple of old Pinot Noir vineyards in 2004 and promptly bought them. But enough about Pinot Noir. 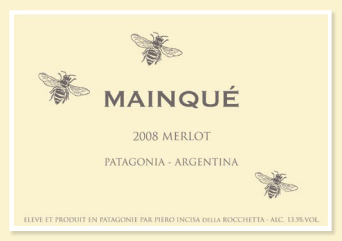 Bodegas Chacra’s vineyards are in the village of Mainqué, and the village lends its name to their Merlot. 100% Merlot, 24 months in french oak. Proper rich and well proportioned kit but without the jammy intensity of classic New World Merlot; medium-bodied and refreshing; blueberry and blackcherry fruit with subtle spice; and finishing crisply and cleanly. Great with a nice dinner, great with the BBQ, great with a cheese and pickle sandwich. Now, the all important pronunciation. Apparently, one should resist the urge to pronounce Mainqué MANKY, well it doesn’t make it sound very nice, does it. It’s more like MON-KAY. But, then again, that sounds like Johnny Vegas calling his mate in the PG Tips advert, so who knows. Pronounce it as you will, but uncork a bottle this Bank Holiday weekend and toast the fact that it’s not raining; or that you were clever enough to bring an umbrella. Our shops are open as normal this Saturday (’til 8), our Chiswick shop is open on Sunday too (11 – 5), but all of our shops will be closed on Bank Holiday Monday.